There's still time to vote in our FTO referendum! There's still time to have your say on how your union is run in the Big Vote – all students are being given the chance to vote on proposals to change the structure of our Full-Time Officer Team - reorganising the make up of the team. The union currently has six Full-Time Officers - the President and five Vice-Presidents with responsibilities for Education, Activities, Welfare & Community, Campaigns & Communications and Union Development. You'll have the option to answer 'Yes', 'No' or 'Abstain'. Voting closes at 4pm on Friday December 7 and can be found here. 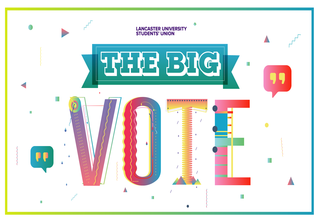 If you have any issues with voting contact elections@lancastersu.co.uk as soon as possible.